To visualize in a dynamic way the standard of the Cotentin donkey, move your mouse on the various areas on the body of the donkey below. You will see under the photo the description of the selected zone. and the female at 1,15m (11.1hh) to 1,30m (12.3hh). The minimal sizes indicated can be decreased by 3cm if the type and conformation are excellent. 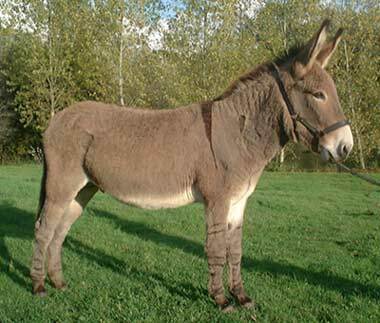 COAT: Ash grey, blue grey or dove grey with a defined cross and some donkeys have leg stripes. The coats that are excluded: bay-brown, black and white. TAIL: The colour is the same as the coat. BELLY: White grey, including the breast, the groin and the inner of the thighs. HEAD: Straight, formed well to the neck. With or without reddish shades. The forehead is the same colour is shades of black to dark is grey/white. END OF NOSE: Shades of black to dark grey. EARS: With good dimensions (half the facial length), opened well, with the circumference and the base darker. EYES: Bright, with glasses grey-white, sometimes encircled the russet-red one, well marked arch of the eyebrows. NECK: Strong, with a straight mane. MEMBERS: Solids, with a firm stance.